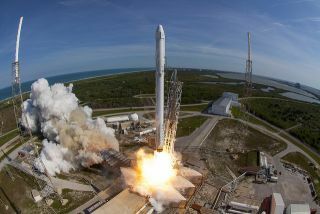 SpaceX's Falcon 9 rocket lifts off from Florida's Cape Canaveral Air Force Station on April 8, 2016, sending the company's robotic Dragon cargo capsule on its way to the International Space Station. SpaceX's Falcon 9 and Falcon Heavy rockets can launch weightier spacecraft than previously thought, company officials said. On Saturday (April 30), SpaceX founder and CEO Elon Musk announced via Twitter that the company has revised the maximum-payload capabilities of the two boosters. According to the new specifications, the Falcon 9 can actually haul 50,265 lbs. (22,800 kilograms) to low Earth orbit (LEO) and 18,300 lbs. (8,300 kg) to geosynchronous transfer orbit (GTO); the previously cited figures were 28,990 lbs. (13,150 kg) and 10,690 lbs. (4,850 kg), respectively. This SpaceX graphic shows the maximum-lift capabilities of the company’s Falcon 9 and Falcon Heavy rockets. "No physical changes to the engine. This thrust increase is based on delta qual tests. It is just tougher than we thought," Musk tweeted on Saturday. The in-development Falcon Heavy integrates three Falcon 9 cores, giving the huge booster 27 first-stage engines. The rocket, which is scheduled to fly for the first time in late 2016, will be able to launch 119,930 lbs. (54,400 kg) to LEO, 48,940 lbs. (22,200 kg) to GTO and 29,980 lbs. (13,600 kg) to Mars, according to the new specifications. These numbers are all slightly higher than previously published estimates. The Mars figures are not mere fanciful inclusions. Musk has said repeatedly that he founded SpaceX primarily to make humanity a multiplanet species, and last week the company announced that it plans to launch its Dragon capsule toward the Red Planet aboard a Falcon Heavy on an uncrewed mission as early as 2018. The company has already twice successfully landed a Falcon 9 first stage during orbital liftoff, the first time on terra firma in December 2015, and the second time last month on a robotic ship in the Atlantic Ocean. Reusable rockets need to carry more fuel (as well as landing legs) to come back softly to Earth, a fact that reduces their maximum-payload capabilities. "Max-performance numbers are for expendable launches. Subtract 30 percent to 40 percent for reusable booster payload," Musk tweeted on Saturday.